An Extra Low Dispersion (XLD)*1 lens made from high-grade materials delivers best in class resolution. Tamron's own Ultrasonic Silent Drive (USD) *2 and Vibration Compensation (VC) make the lens fast, quiet and easy to use. March 9, 2010, Saitama, Japan - President and CEO Morio Ono of optical equipment manufacturer Tamron Co., Ltd., announced another advance in their pursuit of high resolution images in the telephoto lens category with the development of a 70-300mm F/4-5.6 telephoto zoom lens featuring image stabilization-VC (Vibration Compensation) and an ultrasonic auto-focus drive -- USD (Ultrasonic Silent Drive). The SP 70-300mm F4-5.6 Di VC USD (Model A005) high-resolution DSLR telephoto zoom lens has been produced for the Nikon mount, with the development of compatible mounts for Canon and Sony to follow*3. While this new lens is designed for digital SLR cameras, it can be used with both full-frame sensor and AF 35mm cameras with a zoom range of 70-300mm; or with APS-C sensor cameras where the angle of view will change the zoom range equal to 109-465mm*4. With superior optical performance, Tamron's own USD (Ultrasonic Silent Drive) and VC (Vibration Compensation), the SP 70-300mm F4-5.6 Di VC USD (Model A005) provides the performance of a high-end premium telephoto zoom that is appealing to a broad spectrum of photography enthusiasts. (*1) XLD-Extra Low Dispersion lens is made from specialized high-grade glass that has lower dispersive properties than standard LD lenses. (*2) USD-Ultrasonic Silent Drive is Tamron's proprietary ultrasonic motor drive. (*3) The Sony mount is not equipped with the VC image stabilization mechanism, as anti-shake functionality is included in the body of Sony digital SLR cameras. Consequently, the name of the Sony mounted lens, SP 70-300mm F/4-5.6 Di USD, does not include the VC description. In the pursuit to achieve the most outstanding image resolution in the 70-300mm class, Tamron's Anniversary lens - the SP AF70-300mm F4-5.6 Di VC USD (Model A005) - utilizes an advanced optical design that features a LD (Low Dispersion) and an XLD (Extra Low Dispersion) lens element made from specialized materials that prevent chromatic aberration. As a result, the SP AF70-300mm F4-5.6 Di VC USD (Model A005) boasts sharper contrast and greater descriptive performance than all others in its class. In addition, it is the first Tamron lens sporting a USD (Ultrasonic Silent Drive), Tamron's very own ultrasonic auto-focus drive mechanism. This USD mechanism delivers fast focusing, making it a perfect telephoto zoom choice for photographing sports, racing, or other fast-moving subjects. The lens also boasts Tamron's proprietary VC (Vibration Compensation) image stabilization to assist in hand-held photography, not only at long focal length ranges where blurring is common, but also under low-lit conditions, dramatically enhancing photographic freedom. This combination of best in class image resolution, Ultrasonic Silent Drive and Vibration Compensation is a new achievement of Tamron technology, culminating in the production of a premium 70-300mm telephoto zoom lens. New optical system optimized for digital cameras achieves top resolution in the 70-300mm class with specialized glass elements including an XLD (Extra Low Dispersion) lens This lens advanced optical design employs a sophisticated XLD (Extra Low Dispersion) lens element made from specialized high-grade glass that has lower dispersive properties than standard LD lenses (where refraction causes the dispersion of white light into spectral hues). The dispersive properties of the XLD lens are at a level similar to fluorite, and in combination with LD elements make for an optimal optical design that delivers best in class resolution with advanced axial chromatic and magnification aberration correction - major inhibitors of image quality enhancement. The result is a lens that delivers sharp contrast and better descriptive performance throughout the entire zoom range. The lens is equipped with Tamron's first-ever ultrasonic auto-focus drive USD (Ultrasonic Silent Drive). It achieves faster focusing making this telephoto lens perfect for photography of sports, motor racing, and other fast-moving subjects. With advanced motor technology and newly developed software, Tamron's USD delivers precise and noiseless focusing at turbo speed. 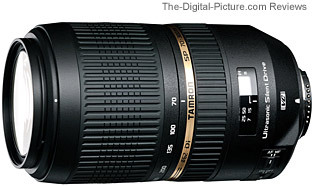 Tamron's USD works with the high-frequency ultrasonic vibrations that are produced by a ring called a 'stator'. Energy from the vibrations is used to rotate an attached metallic ring known as the 'rotor'. Piezoelectric ceramic, an element that produces ultrasonic vibrations when voltage of a specific frequency is applied is arranged in a ring formation on the stator. This electrode configuration of piezoelectric ceramic causes two ultrasonic vibrations to occur in the stator. By effectively combining these two ultrasonic vibrations, it is possible to convert the energy from the vibrations that produced simple motion into energy known as 'deflective traveling waves', which then moves around the circumference (rotation direction) of the ring. With the USD, the friction between these deflective traveling waves created on the metallic surface of the stator and the surface of the rotor produce force, causing the rotor to rotate. The focusing ring lens, which is linked to the rotor, is thus moved, creating a fast and smooth auto-focus drive. The SP 70-300mm F4-5.6 Di VC USD employs Tamron's esteemed image stabilization mechanism-VC (Vibration Compensation) seen in both the AF18-270mm Di II VC (Model B003) and SP AF17-50mm F/2.8 XR Di II VC (Model B005). With VC, the photographer has the freedom to shoot at a shutter speed that is an extra four stops slower without having to worry about blurring. This makes capturing handheld, evening, night, and interior shots much easier. Tamron's VC mechanism employs a three-coil system, whereby three driving coils activate the shake-compensating VC lens group electromagnetically via three steel balls. The VC lens elements are held in place only by contact with the steel balls, achieving smooth movement with little friction. This provides a stable viewfinder image with excellent tracking performance that eliminates the blur from camera shake for cleaner, crisper shots. Auto-focus has many benefits but sometimes the photographer needs the control of manual focus. Full time manual offers just that: the crossover from auto-focus to manual focus by simply adjusting the focus ring, allowing the photographer to make adjustments on the fly. This feature helps the lens produce impressive results even in telephoto situations where the depth of field is narrow. When focusing, the internal elements of the lens move and the lens' external size does not change. This offers better balance and easier telephoto shots. Moreover, the barrel is not subject to stray light entering from external helicoids that can negatively affect images. And because the external elements do not move, it makes it easier to utilize polarizing filters and the flower shape hood to control the amount of light that enters the lens. With a full-frame digital or 35mm SLR, portrait and medium telephoto shots can be achieved on the wider 70mm end of the range and spectacular telephoto shots at the longer 300mm side. When using an ASP-C sensor camera the angle of view changes, giving it the equivalent range of 109-465mm for bold ultra-telephoto shots. And with a maximum magnification ratio 1:4, the lens can be used to explore in the realm of semi-macro photography. Digital photography requires extreme precision, which is why Tamron incorporates new BBAR (Broad-Band Anti Reflection) multilayer coatings that reduce reflection into the lens elements. This ensures excellent performance in all photographic conditions and enhances light transmission on both long and short wavelengths. Also, Tamron applies internal surface coatings on cemented surfaces of lens elements to make images sharper with better color reproduction and balance. Tamron adopted a simple design with a smooth silhouette to ensure that this lens fits well with various SLR cameras. The exquisite textured paint gives a well-crafted finish to the exterior. The flower-shaped hood has been designed specifically to block out damaging light rays and ensures clear, sharp descriptive performance. The Sony mount does not include the VC image stabilization functionality, as the body of Sony digital SLR cameras contains built-in image stabilization functionality. *Length and weight values given are for the Nikon mount. Specifications, appearance, functionality, etc, may be changed without prior notice.